Many cities were shaped by religious movements. In Amsterdam in the Middle Ages almost a third of the buildings were monasteries and other religious buildings. For some time the view was that religion would disappear. A neighborhood like the Bijlmermeer was designed for such a secular, non-religious future. Yet, this future never came and ironically the Bijlmer currently houses the highest number of religious communities in the Netherlands. What’s happening in the city when it comes to religion, and what does the future look like? In this second edition of De Staat Van God we bring you inspiring mini-classes by top of the rank researchers and professionals in the field. 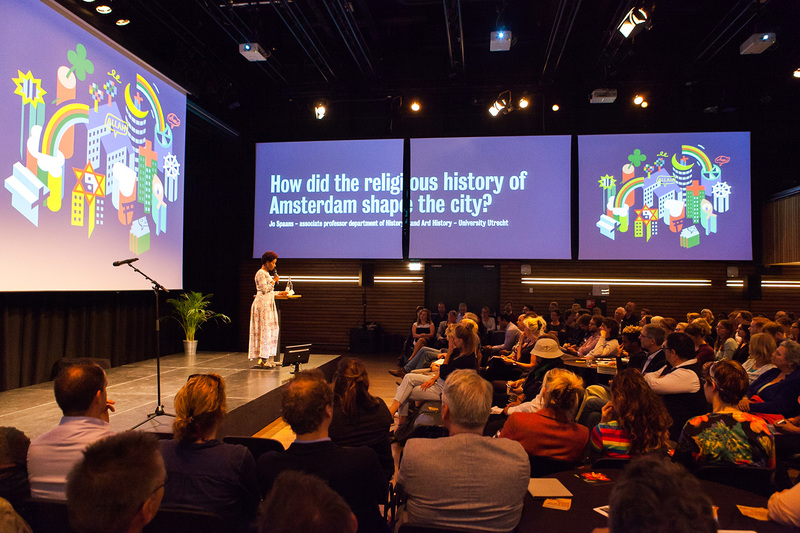 How did the religious history of Amsterdam shape this city? Which urban spaces shape the identities of young Muslims in Newcastle? Why do cities around the world seem to be the perfect breeding ground for evangelical mega-churches? How do secular city dwellers find meaning and spirituality in an urban context? Join us in Pakhuis de Zwijger, and find out! The VU and UvA organise a three-hour city walk that will take you to some special sacred places in town. De Staat Van God is een initiatief van Firma Hoe Dan Wel, en geïnspireerd op het Amsterdamse ‘De Staat van de Stad’. Op deze avonden brengen we de nieuwste feiten en cijfers op gebied van religie op de planken voor een breed publiek. De eerste editie vond plaats in 2017 in de Amsterdamse Stadsschouwburg. Wilt u op de hoogte blijven van het programma en de kaartverkoop? Wij respecteren uw privacy. Uw gegevens worden niet aan derden verstrekt of voor commerciële doeleinden gebruikt.